First off, I want to emphasize that carving a snowboard is probably the most important and fundamentaly essential part of all around snowboarding progression. Not only because it will end up being a major piece of your skills base, facilitating further progression towards freestyle or board skill oriented goals, but also because it is incredibly fun and pure. The key to developing your skills in carving a snowboard is just to work on it. Try, try, and try some more. Understand that snowboards are designed to carve. If you can get into the right position and pressure the edge with patience and trust in the board it will respond and arc gracefully underneath you. Oh boy, that feels nice. Patience and Trust are important because in relation to a slid or more beginner turn, learning to really carve can be a little scary. Just because it feels like your just going to tip over. You may even do that a few times, but believe that if you keep working on it, sooner or later it will click, and oh yeah, you’re a carver. Again, I must stress the importance of these advanced basic skills. Cross over and cross under are 2 different ways to execute carving a snowboard. They are both fun and it is good for your advanced basic skills to practice both. Find a nice smooth run with a mild pitch. All carving drills and practice are easier on runs that are not too steep. If it gets steep, it is hard to hold a clean carve without going too fast. This will force you to skid the turn to slow down, thereby wasting the carving drill. So use a mellow run. You will initiate the turn by simply using your whole body the lean over the edge, pressure the side-cut of the board and gracefully arc into the turn. You will use a subtle upper body movement to lead the turn and set up for the edge change. As you finish your first turn and get ready for the second, use as little movement as possible to just smoothly shift your weight from one edge to the other and enter the next turn. Through out the cross over turn your upper body will follow the path of the turn and like the board and lower body arc back and forth across the fall line. Continue linking smooth arcing turns in this way and you are performing cross over turns. Smooth and fun. Good job. You will initiate the turn this time with a bit more upper body rotation initiation combined with an aggressive move with the knees and ankles to get the board arching. Cross under turns are quicker from edge to edge and when you get them going, your upper body will move down the hill more parallel to the fall-line. Try to keep your body upright and leading with rotation but stable as your center of mass (near your belly button) move fairly straight down the hill, and your legs and the board turn quickly from edge to edge underneath you. Using the two drills above, now try out doing 3 or 4 cross over turns, then 3 or 4 cross under turns and so on. Switch it up, mix it up and feel it out. All right you are developing better board skills and loving it, I hope. Keep it up. Running gates or cones is really fun and is seriously good for getting better at carving a snowboard. Remember that a cross over type turn is good for a course with bigger turns, while a cross under turn is better for a course with tighter turns. Generally, a course with bigger turns would be called a giant slalom, while a course with tight turns would be called slalom. If you have access to gates or cones and a run you can use them on, try running a variety of different courses and practice. If you don’t have access to gates or cones, most areas have a self timer course that is usually set up near their NASTAR courses. Ask for NASTAR by name, as it is well know and can be found at nearly any resort. Self timers may cost 50cents or a dollar, but are well worth the fun and practice they provide. Look head- depending on the size of the turns, you should e looking ahead down the course by 2-4 turns. This allows time to intuitively pick your line and set up for each turn accordingly. Take a high line- this means you will start the turn well above the gate or cone so that you can execute the majority of the turn before you pass the gate. As you pass the gate finish the turn aggressively to set up a line across the hill that will allow you to start the next turn high and continue the high line. Race with friends and push yourselves. Practice carving a snowboard, then practice more…. This is a great drill for advanced basic skills development. It can take your ability in carving a snowboard to a new level. It requires a piece of bamboo or some other light stick or pole. You can do it just by raising your arms like airplane wings, but using a bamboo works better and really exaggerates the effect. There are many ways that angulation and angulating apply to snowboarding. Most often when I bring it up, people think I am referencing the angle of the board to the snow. This is not the angulation we will develop and practice in this drill. Imagine a toe side or heel side turn. Now imagine a line that runs from the head to the hips, and a second line that runs from the hips to the edge of the board. By keeping the upper body upright and creating a high edge angle between the upper body line and lower body line, you can increase your body weights position over the edge and make the carve more powerful and true. You will also use your shoulders to add to this effect. Both your shoulders as they relate to the direction of travel and to the snow surface that you’re riding on. Okay, here we go. Find a wide mellow groomed run and try to do this drill during a time of day when there is not much traffic. You will use a wide area and you will have a big pole across your shoulders, which can be dangerous if you try to do the drill to close to traffic. The goal here is to carry the pole across your shoulders with your arms up on the bamboo out to the sides. You must keep the bamboo parallel to the ground and your upper body facing down the fall line. If you allow your shoulders to dip one way or the other, the pole will hit the ground and it could make you crash, so don’t do that. Now, put the pole up on your shoulders and start riding. Make smooth, round, S turns, keeping your upper body and the pole perpendicular to the fall-line and parallel to the snow. You will immediately feel how this make your turns more powerful. Keeping your upper body in the right position to not allow the pole to twist with the turn and not hit the ground will put your body from head to board edge in a very strong and angulated position. Play with it and enjoy the sensation. Now, put the pole down and make some turns maintaining the body position you were practicing with the pole across your shoulders. WOW, that feels cool, doesn’t it. So, there you go. Now you have some new carve skill building tools. 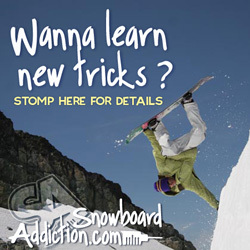 Use them and start building your progression pyramid with solid carving a snowboard skills.